For those wondering about yesterday's brunch crepes, here is the recipe. Not much of a recipe, really, but it is super tasty! 1. Steam asparagus while you are making the crepes. 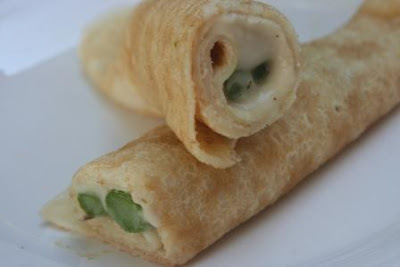 My original vision was to make smaller crepes so the asparagus would stick out of the ends. So, whatever you want. Rinse asparagus in very cold water to stop the cooking and set aside. 2. Heat oil in a small saucepan over medium heat. Whisk in flour and cook for a few mins, whisking constantly. Slowly whisk in soy milk and bring to bubbling. Season to taste and remove from heat. 3. Pat asparagus dry. Place two stalks on one side of the crepe and top with a generous tbsp of sauce. Roll up. Repeat with remaining crepes. Place in a warm oven until ready to serve.